There comes a point at which travelling alone throughout the entirety of Asia, or sampling every cocktail in Andalusia in a short space of time, gives way to other priorities. When one door closes on your travel lifestyle, another one opens, and that is especially true of travelling with a family. 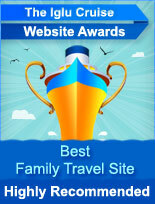 This is the Iglu Cruise award for Family Travel sites. If you’re travelling with a partner, kids and even a furry friend, the resources you’ll find on this list are absolutely invaluable and run by dedicated individuals. Any advice we come across which helps travellers carry out the difficult task of planning a family holiday is an asset to the community, but the following five sites are a premier example of how to do it right. While travelling with the family can bring with it additional difficulties, the subsequent rewards more than make up for it. You may be well-versed already in this particular field of holiday-making, but at the very least you will find some inspiration on where to go for your next mass adventure, and there are some handy guides as to which resorts are family friendly (as well as which your tribe should steer clear of).